Short History of Irish Plein Air Painting: Lessons in How to Paint in the Open Air. The tradition of plein-air painting (as opposed to studio work) reached its apogee in the 19th century in France, when artist colonies sprang up all over the country from 1840 onwards in villages like Barbizon, Grez-sur-Loing, Pont-Aven, and Concarneau. Inspired by pioneers like John Constable (1776-1837) and Richard Parkes Bonington (1802-28) from the school of English landscape painting, as well as Theodore Rousseau (1812-67) and Jean-Francois Millet (1814-75), and initially linked with the Naturalist and Realist movements, which were themselves a reaction to the social changes caused by the Industrial Revolution, the principles of plein-air art later formed the core of Impressionism - specifically Impressionist landscape painting - as practised by Monet (1840-1926) during the last 30 years of the century. Other leading plein-air Impressionists included Camille Pissarro (1830-1903), Pierre Renoir (1841-1919), and Alfred Sisley (1839-1899), all of whom made significant advances in the depiction of light. It was Monet, however, who adhered most closely to the practice of plein-air methods, continuing to refine his painterly techniques (even when plagued with failing eyesight) in his monumental series of water lily paintings completed in his garden at Giverny, until in death in 1926. Nineteenth century Irish landscape artists were also active exponents of outdoor painting. Many of them travelled to the Continent to study fine art in Antwerp or Paris, and afterwards joined one of the rural artistic communities listed above. This group included such Irish artists as: Nathaniel Hone the Younger (1831-1917), perhaps the finest Irish landscape painter of his era, Augustus Nicholas Burke (1838-91), Aloysius O'Kelly (1853-c.1941), the society painter Henry Jones Thaddeus (1859-1929) and the romantic artist Frank O'Meara (1853-88). Later Irish emigrants included the Impressionists Roderic O'Conor (1861-1940) and Walter Frederick Osborne (1859-1903), Joseph Malachy Kavanagh (1856-1918), John Lavery (1856-1941), Nathaniel Hill (1861-1934) and Dermod O'Brien (1865-1945). Another visitor to Brittany was the Dublin-born artist Stanhope Forbes (1857-1947), later an important member of the innovative Newlyn school of landscape painting, together with the Limerick-born artist Norman Garstin (1847-1926). The 'Breton tradition' was continued in the 20th century by figures like William John Leech (1881-1968). A number of famous landscape paintings were produced by these visitors to France, including Old Mill At Grez (1882, Hugh Lane Municipal Gallery of Modern Art, Dublin) by Frank O'Meara; On the Loing (1884, Private Collection) by John Lavery; Apple Gathering, Quimperle Brittany (1884, National Gallery of Ireland) by Walter Osborne; and Field of Corn, Pont Aven (1892, Ulster Museum) by Roderic O'Conor. At home, the plein-air tradition was vigorously maintained by people like Paul Henry (1876-1958) and James Humbert Craig (1878-1944) in their powerful West of Ireland views. Noted landscape works from Northern Ireland artists included the French-style rural views of Frank McKelvey (1895-1975), the quiet country scenes of County Antrim and County Down of the Belfast-Swiss painter Hans Iten (1874-1930), and the picturesque views of Tom Carr (1909-1999) and Maurice Canning Wilks (19101984). Lastly, one should not forget the 'school' of Tory Island open air painting in Donegal which emerged during the 1950s, due largely to Derek Hill (1916-2000) and his unusual 'protege' the primitive Tory Island painter James Dixon (1887-1970). The wild landscape of Ireland continues to attract outdoor painters from all over the world, not least because of its diversity: from the rugged coastline of Mayo, Galway, and Donegal, to the limestone hills and fields of The Burren in Clare, and the Glens of Antrim in the North. The indigenous outdoor painting tradition is continued in the works of contemporary artists such as: David Nolan (b.1966), John Morris (b.1958), Paul Kelly (b.1968), Henry McGrane (b.1969) and Norman Teeling (b.1944), to name but five. They are among some of the best Irish artists. 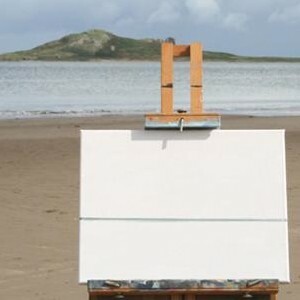 The brainchild of a small group of friends attending life-drawing evening classes at the Wexford Arts Centre, ART IN THE OPEN is now Ireland's principal plein-air painting event. Now in its third year, the festival runs during the August Bank Holiday weekend and brings together artists from all parts of Ireland, Europe and America. There are numerous prizes to be won, but one of the major attractions is the opportunity to meet and socialize with painters from around the world. Other ART IN THE OPEN events include regular "Paint Outs" in the South East and elsewhere. These are open to any artists who enjoy working outdoors. For dates and other details, see website, below. ART IN THE OPEN is organized by members of the South East Plein Air Painters of Ireland Association (SEPIA), and supported by Wexford Borough Council and Wexford County Council. It is also a member of AOIFE (Association of Irish Festivals and Events). PLEIN EIRE Networking Website New! Plein-air painting is easy to start, but extremely difficult to master - especially in the unpredictable Irish climate which places a premium on rapid brushwork. It requires good drawing skill, knowledge of perspective, an understanding of colour and tonal variety, composition skills, and - above all - a love and appreciation of the landscape. Not surprisingly, most of the great plein-air artists were academy-trained in life-drawing and other fundamentals. One of Ireland's most active contemporary painters is David Nolan (b.1966), who, in addition to being a talented portraitist, is an outstanding practitioner of plein-air work. We are indebted to him for compiling a brief visual demonstration which illustrates some of the lessons of oil painting outdoors. The location is Burrow Strand Sutton, Co. Dublin; the time is 12 noon. There is wide variety of equipment you can use for painting outdoors. Use any type of easel as long as it is easy to set up. Or you can sit on a fold up chair without an easel just a small board on your knees. A pochade box is ideal. Your first task is to decide on the view you wish to depict. You cant fit everything onto the canvas. Spend 10 minutes or so, checking what looks best. Pay attention to colour harmony: ie. that grey cloud colour has a little blue in it, the same blue that is in the sky. To focus your attention, you can use an A4 piece of card with a rectangular hole in the middle, as a view-finder. I am going to centralize my painting on the Island, in the middle, which I will draw close up, taking up most of the canvas. Many beginners are intimidated by a white painting surface and arent sure where to begin. You can underpaint a colour, scrub on a grey or yellow ochre - which can be done at home before you set out. This hides the white canvas, although you might choose to leave a few spots unpainted. I usually take a more direct approach and work firstly with the oil in a watercolour fashion, building up to opaque paint, usually from dark to light. I recommend using a small watercolour brush (No 8 or No 10). Yes, a watercolour brush, which will need to be fully cleaned with water and washing up liquid after you finish, otherwise the oil paint and solvents will destroy it. I am starting with the horizon line, using a straight edged stick as a ruler. I am drawing with a No 10 brush. The horizon line could be near the top which would leave you with lots of sea and sand. Or nearer the bottom, leaving you with a big sky. After drawing the basic outlines of the picture, next, you 'block it in' - that is, put a basic colour underneath. Block in the darkest shadow areas. Unfortunately the sun keeps coming in and out, which is changing the colour! Titanium White, Cad. Lemon, Cad. Yellow, Cad. Red, Alizarin Crimson, Naples Yellow, Yellow Ochre, Burnt Sienna, Ultramarine Blue, Cerulean Blue, Viridian, Ivory Black. The sea may be blue in the bright sunshine, but here there's nothing blue about it! In fact, the sky, the sea and the sand are all mixed with grey colour. (If you isolate it, the sand is actually grey/brown). The paint that comes out of the tubes is vibrant. The colours in the sea are green, blue, grey and a hint of red, mix them all up to get a neutral colour. Now comes the sky. I put in the blue colour, or rather the two blue colours (which unfortunately the photograph does not show): the one at the bottom is light shy, a light blue with a small bit of turquoise in it. The other stronger blue is at the top of the sky, based on ultramarine with lots of white added. The clouds are dark at the bottom, grey, blue, little red, and white all mixed together. Get the basic feeling of the painting after 30-40 minutes. Because the paint has been applied thinly, I can scrape or wipe off the areas that arent working without too much trouble. Start dark and work lighter: white clouds need to be against something dark to show up. Start painting lighter colours on top of the dark colours of the island. Light colours should represent where the sunlight falls. Paint lighter colours on top of the clouds, and a lighter colour on top of the sea. The sand in the foreground is the original block-in colour which I left as it was, quite textured. To finish the forms of the cliffs, I paint the lightest areas, where the sun strikes most directly. I also add some swirling highlights of almost pure white to the clouds. In the end, the effect is more impressionist than representational. Any type as long as it is easy to set up. Or you can sit on a fold up chair without an easel just a small board on your knees. A pochade box is perfect for putting on your knees. Any flat board 16 x 10 inches will do. Use small to medium sizes. Watercolour brushes are great with oils but need very careful cleaning and have a shortened life span. I have never used hog brushes: they maybe great for painting the outside of your house, but not for oil painting. Most professions use Royal Langnickels, which are made out of mongoose and are designed for oil painting. They are cheap, and the sizes you need are numbers 6, 8, 10, 12, and 16. Use small canvases when painting outside. You can paint on board once it is primed with gesso. Small plastic bag for the used paper towels.  For biographies of other painters and sculptors from Ireland, see: Famous Irish Artists.  For more about oils in Ireland, see: Irish Painting.  For top priced fine art, see: Most Expensive Irish Paintings.